Humans aren’t particularly fast or strong, but we aren’t completely devoid of physical skills: we have a tremendous throwing arm. 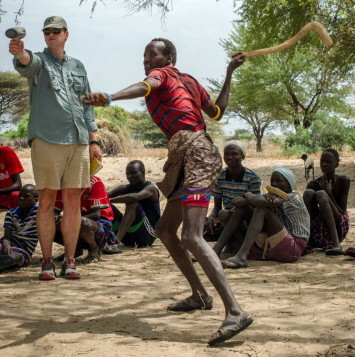 Whether its skewering an antelope on a spear from across the field or doing something sportsy with a ball, humans can throw stuff with great force accurately1. But this shouldn’t be a surprise. Aren’t our ape relatives famous for hurling their…rocks at people? Well not really. Whilst chimps might have a reputation for throwing soft, squishy…stones…at their enemies they can’t do so with the accuracy and force modern humans can (although that isn’t that much of an issue if you’re just trying to cover as large an area as possible with disgusting rocks). In fact, they can only throw stuff at about 1/3 the speed of a human1. So if a chimp is stuck on the other side of a field with a spear you don’t have too much to be worried about; which is good news given they’ve figured out how to make spears and all. But even within the human family we find species that also appear to have lacked our throwing skill. Neanderthals – our ice age cousins – don’t appear to have been that good at throwing and didn’t make any projectile weapons either (although both of these facts are hotly contested). But if the Neanderthals were our cousins then what about our evolutionary grandparents? Could they throw and are Neanderthals just a weird branch who lost the ability, or is throwing something unique to modern humans? And if our earlier ancestors could throw, how far back can we trace the behaviour? Recently a group of researchers decided to try and tackle two birds with one stone (which they obviously hurled at the birds with their magnificent human throwing power) and answer both of those questions. They did this by examining Homo erectus, the 1.8 million year old ancestor of humans, Neanderthals and a bunch of other species whose names I won’t make you remember. Homo erectus was picked because it was the first member of the human family to develop our “modern” body, being tall, upright, bipedal and with a large brain2. In other words, they’re the first species that could conceivably have been good at throwing. Specifically they examined Nariktome boy, a 14 year old African Homo erectus who was lankier than that annoying friend from school who could eat all day without gaining any weight. They found that their scapula (should blade) was very similar to modern humans. Unfortunately this wasn’t enough to confirm Homo erectus was good at throwing, as this modern-like scapula appears to have been cancelled out their much shorter clavicle (collar bone), which would’ve changed the orientation of the shoulder1. However, they also examined those Homo erectus from Dmanisi (which caused such a fuss a year ago) and found that their clavicles were much more similar to the human norm. Perhaps Narikotome boy was just a freakish pile of chimp-rocks and Homo erectus could throw well after all. Or maybe their basic assumption was wrong and clavicle length doesn’t really influence throwing ability. Daasanach man throwing a stick for this research. Remember kids, the only difference between science and mucking about is taking notes afterwards. So they also examined people from the Daasanach group in Africa; notable for doing a lot of throwing (for both hunting, herding and fun), for being relatively lanky and for living in a similar landscape to Narikotome boy1. Did their clavicular length correlate with throwing ability? Answer: no! Examining the Daasanach found that there was no correlation between the speed at which they could throw objects and the length of their clavicle. In fact, they even discovered members of the Daasanach with clavicles of a similar length to both the Dmanisi Homo erectus and Narikotome boy. And of course, even those guys were really good throwers1. 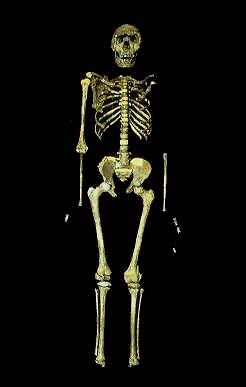 So Homo erectus looks like they were the first humans capable of holding their own in a javelin contest; which pushes the origin of throwing back as early as 1.8 million years ago. So throwing has a long, proud tradition in the human family. However, this discovery also raises something of a contradiction as well as our pride. See, there’s no evidence Homo erectus made any projectile weapons. Sure, some have argued that they hurled their famous handaxes at prey but there’s no evidence of that. There’s also the possibility they created spears out of biodegradable materials like wood (which is how chimps make their spears), but again we haven’t found any evidence this was the case. In other words, there’s a very real possibility the first humans who could throw weren’t routinely throwing stuff; which would strongly suggest that this ability evolved by accident. Yeah, that thing that put food on the table cave floor for tens of thousands of years, that is so important to sports fanatics now….might well be an evolutionary accident. Roach, N. T., & Richmond, B. G. (2014). Clavicle length, throwing performance and the reconstruction of the Homo erectus shoulder. Journal of Human Evolution. Boyd, R., & Silk, J. B. How Humans Evolved. November 20, 2014 in Homo erectus, Technology. ← Can we predict cultural change? I think Major League Baseball pitchers might be at the edge of the human envelope for throwing things. They throw a five-ounce ball at speeds in the 90 MPH range at a small target 66 feet away. It’s a task so challenging that it injures nearly all of them at some point during their career. But what makes that more interesting, I think, is just how drastically that performance can improve when tools are added to the equation. The fastest tennis serve, for example, is almost double that baseball pitch. Oh, no question! For that matter, modern pitching owes a great deal to those tools, which allow intense study of the craft of pitching. That sort of things also maked me wonder whether people of the past “studied” this sort of stuff. Many groups have an intuitive understanding of the world, often talked about in terms of “folk physics” and “folk medicine.” But was there a folk science? To the extent that science means “observing reality, coming up with ideas about what you see, and testing those ideas” … why not? Was Homo Erectus throwing rocks? That’s another one of those “impossible to detect possibilities”. Many rocks naturally accumulate impact fractures from stuff falling on them etc., so it would be hard to spot rocks that were being hurled about instead. I would wager that Homo erectus was throwing rocks, sticks( like the Daasanach man), wooden javelins, etc. To think they could make stone hand axes but not semi-complex pointy sticks like a javelin is a little bit silly to me. It is probably a matter of preservation that we don’t find them. 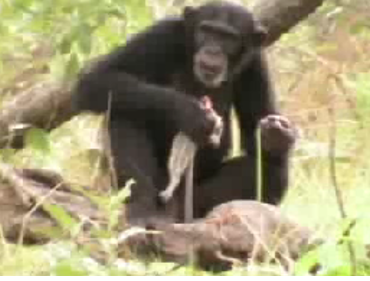 Well chimps have figured out how to sharpen wooden sticks, and I’d wager Homo erectus was smarter than them. Plus we’ve got examples of wooden spears that predate stone tipped ones, suggesting it is indeed an older tradition. So I’d agree with you, I strongly suspect that these first throwers may have been making and using pointy wooden sticks that have simply rotted away.